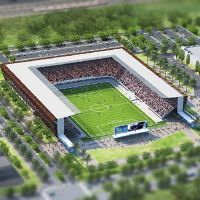 Having suffered from various setbacks, now the new Earthquakes stadium project seems to be moving forward really nicely. Everything is on schedule to see it open in late 2014, while the 2-story club offices and player facilities next to the stadium should be ready significantly earlier. Currently the outline of future stadium is becoming more and more visible with foundation works almost done. The steel girders that will form the skeleton of an 18,000-seat stadium are set to be raised this month. The structure should rise some eight or nine stories, just across a busy street from the Mineta San Jose International Airport.